Brilliantly displaying a traditional symbol of true love, these cherry blossom folding fans are simply sensational! Pretty and practical for a beachfront affair or garden party, the 8 1/4" silk fans have an intricately carved light wood collapsible ribbing structure. Compact when closed and a breath of fresh air when opened, the delightful silk fans arrive individually packaged in white gift boxes. 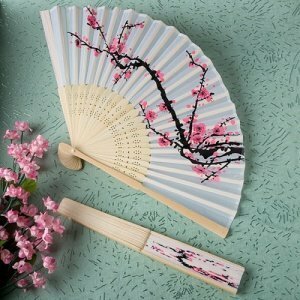 This is an elegant Cherry Blossom Silk Folding Fan by Fashioncraft. It is made of high-quality material. You can see it's not paper, but actual material, with an intricate design on the bottom. And it's very nice as a wedding favor for your guest to fan themselves, or shade them from the sun for that beautiful summer wedding. And if you are looking for a pink cherry blossom pop color to your wedding theme, this is perfect. Personalization is not available for that item but we have the Personalized Delicate Cherry Blossom Design Silk Folding Fan as the personalized version of the fan.